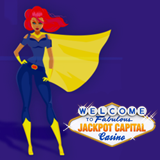 This month, the super heroes at Jackpot Capital Casino are fighting for casino justice for all during the $90,000 Superhero Club casino bonuses event. In their constant battle against boring games and stingy casino bonuses, Wonder Win and her fellow of super heroes, Iron Slot and Captain Jackpot, will be helping frequent players win $17,000 in weekly prizes and will be randomly awarding another $5000 every week so that everyone has a chance to win. Additional cash prizes will be awarded to the casino’s Facebook Friends as well. Jackpot Capital players earn points when they play in the online casino or in the mobile casino. Top point earners get weekly bonuses up to $600. Everyone that plays even a little qualifies for randomly awarded prizes every Friday. The randomly awarded bonuses on Fridays give players a chance to play more through the weekend and improve their Scoreboard ranking and qualify for bigger bonuses during Monday bonusing. Scoreboard prizes rewqrd frequent players but with random draws everyone can win. The $90K Superhero Club event continues until May 15, 2016. Contest details and current Scoreboard rankings are available at: http://promotions.jackpotcapital.eu/superheroclub . Jackpot Capital’s Facebook page is https://www.facebook.com/jackpotcapitalcasino. Jackpot Capital Casino offers hundreds of slots and table games from Realtime Gaming (RTG) including the new Big Bopper with bonus features that keep on paying as long as the Bopper keeps on singing. It’s available in the download, instant play and mobile casino.